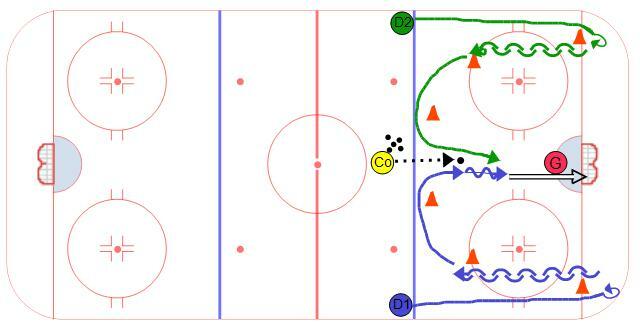 Pee Wee / U12 Half Ice Practice Plan #1 | Ice Hockey Systems Inc. 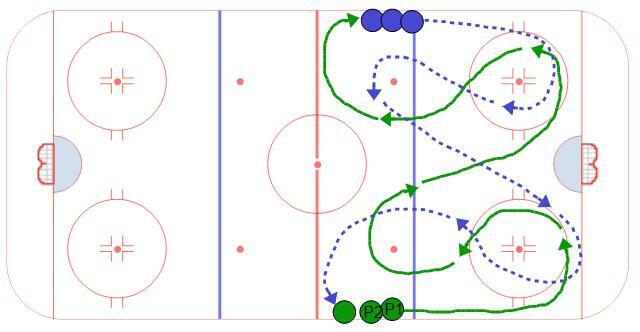 Here is a good hockey skating drill to do in warm up or at the end of practice. Set up two lines at each blue line along the boards. Players will go in groups of two for the sake of competing. The first player tries to not let the second player catch them. Have the players focus on moving their feet the entire time at an uncomfortable pace. Once the players get to the end of the other line the next two players from that line can go. 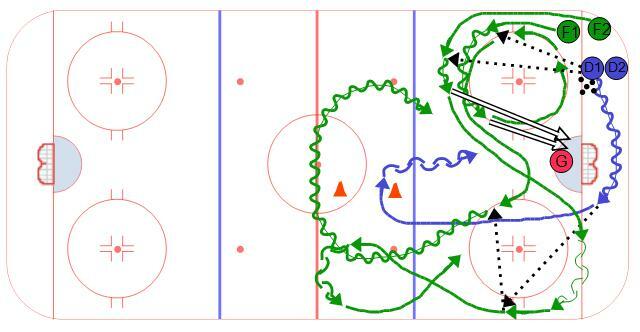 As simple as this hockey drill appears it is very effective for particular situations. One situation is for practices or sessions that involve more than 25 players. The other situation is for a half ice practice. 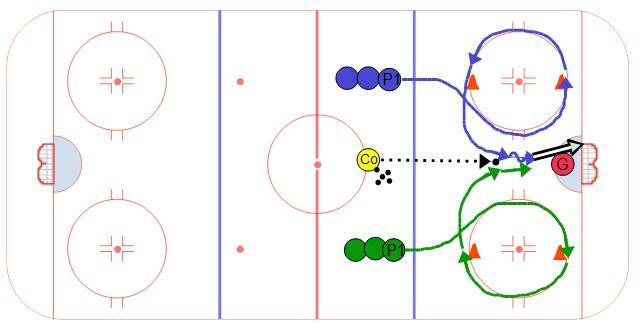 Each repetition involves 4 players and 4 shots at each end, so in a full ice practice 8 players are involved in each repetition. Each repetition consists of four shots. The repetitions are started on the whistle in which P1 carries the puck up the wall around the top of the circle and shoots. After the shot F2 does the same thing out of the other corner. After F2 shoots the puck then P3 carries the puck along the blue line and transitions around the face off dot so they are always facing the net. P3 then carries the puck into the zone and takes a long shot on net. Again, once the shot is taken then P4 does the same thing from the other side. Players out of the first two lines should work on moving their feet all the way through the shot. Players in lines 3 & 4 should work on controlling the puck while in transition and keeping their head up, especially as they enter the zone. It is also important to remind players in the corner to move the lines up so they do not get hit by pucks that miss the net. On the same subject it is good to emphasize hitting the net! This drill is just like the Forwards overspeed drill but geared towards the footwork of the defense. The players are split into two teams and the start of each line is placed on the off sides face off dots. The coach has the pucks in the middle of the ice just outside the blue line. Players have to start facing the coach. On the whistle the players go into the their backwards crossovers to get speed offf the line. They continue backwards around the circle. At the top of the circle where the cone is placed they transition to a forwards skate and race for the puck. Again, the first player to the puck is rewarded with a scoring chance. We have numerous overpeed races geared towards forwards so here is one that focuses on footwork for defense. Similar to the previous drill, the coach will have the pucks at center ice just outside the blue line. Set up cones or discs as shown in the diagram. 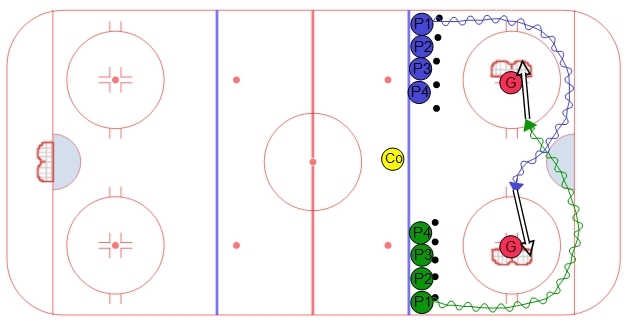 Two lines of players are required, each along the boards at the bliue lines. On the whistle the players skate forward and transition towards the middle of the ice around the cone on the goal line. They skate backwards as fast as they can to the cone at the top of the circle. At the cone they open up their hips and pivot forwards to skat around the cone in the middle. Emphasize no cross-overs. In fact you can make a rule that a player is disqualified if they use cross-overs to transition to forwards. 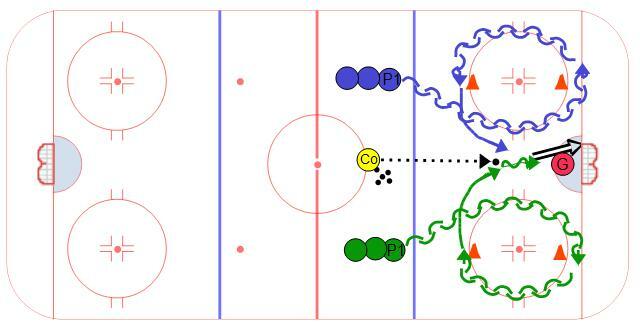 The players then race to the puck that is placed in the slot by the coach. This forces players to move their feet faster than what is comfortable.